The spacious rooms each have a fireplace, vaulted ceilings and down comforters to add the distinctive touch of European luxury. 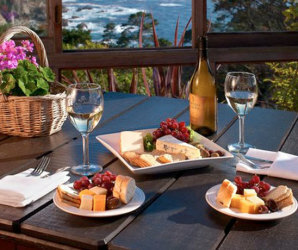 The Inn is close to everything in Carmel, so dining and walks to the Carmel beaches are at your beck and call. Shopping for unique items or touring the many art galleries that are part of Carmels charm are easily part of your visit from this location. The complimentary Continental breakfast provided is delivered to your room where privacy and comfort prevail. Afternoon refreshments, wine and hors doeuvres, are served daily and you can relax in your whirlpool bath before dining. Upon returning to the Carriage House Inn, you can enjoy a cappuccino or espresso in the library before retiring into the quiet of your charming room or suite. For the romantically minded, there is a honeymoon suite at the Carriage House Inn with vaulted ceilings that offers both privacy and elegant comforts. If you choose to dine at one of Carmels romantic spots, you will want to take a stroll along the beach and enjoy another day in Carmel. Ask for the Romance Package with a special offering of chocolates and champagne in your room and dining at one of the best restaurants in Carmel. Conveniently situated in the Carmel Village and a block from the best shopping in Carmel, the Carriage House Inn has great access to the Monterey Bay, Pacific Grove and south on Highway 1 to the redwoods of Big Sur. Golf, whale watching, fishing, kayaking, surfing, swimming, picnicking and hiking are all within a brief walk or drive. Many marine sports are available to book and a trip to any of the local beaches is an incredible experience of white sand and clear turquoise waters of Point Lobos or the Garrapatta Ridge trail in Big Sur, just 20 minutes south of Camel. Monterey Aquarium is a brief drive from Carmel and from Carmel Valley it is a short trip to the wineries and some of the finer resort properties with golf, spa, dining and wine tasting, attractions and experiences that are well worth the drive and through the countryside of Carmel.